Inspiration exists absolutely everywhere: from the most normal of life moments to golden nuggets overheard at speaking events, time in nature to time in creativity-condensed spaces like galleries or music venues. Yet, in my 'in constant search of #inspo' perspective, and as someone whose brain seeks the new, different, wild and sometimes weird as sources of finding more space to create from, there seems to be one experience where inspiration tends to flow forth like a mother: travel. In my trips and tumblings around BC for both personal and client based work, I've found that in new spaces with new faces, sounds, lifestyles and heck, even grocery stores, my brain opens up in a way I've never experienced before. So, because sharing is caring, I've pulled together four of the most inspired spaces I've found myself in throughout 2016 so you too can consider what an unplug from the daily deal of l-i-f-e could do for your own sweet (and wildly creative) head and heart. NOTE: I use 'unplug' not because these places are off the grid. Exactly the opposite...actually: they all have decent to radical WIFI. Unplug for me means getting out of the high vibration of a city or a regular work flow to access a slower, less frantic, and more body/mind/soul/spirit/nautre tuned in pace. Hence, #creativity. The off the grid post will follow -- when I go off the grid. Sometime. I committed to white space (aka: unbooked and uncommitted to clients 'me time') as one of my goals for the year. Early July I booked myself, for what seemed like a random three days in August, into the Writer's Cabin after I put a call out into the world for 'a place to write' and my sweet pal Matt Corker threw this gem my way. Shortly thereafter, the two weeks prior to check in got precariously over-booked. 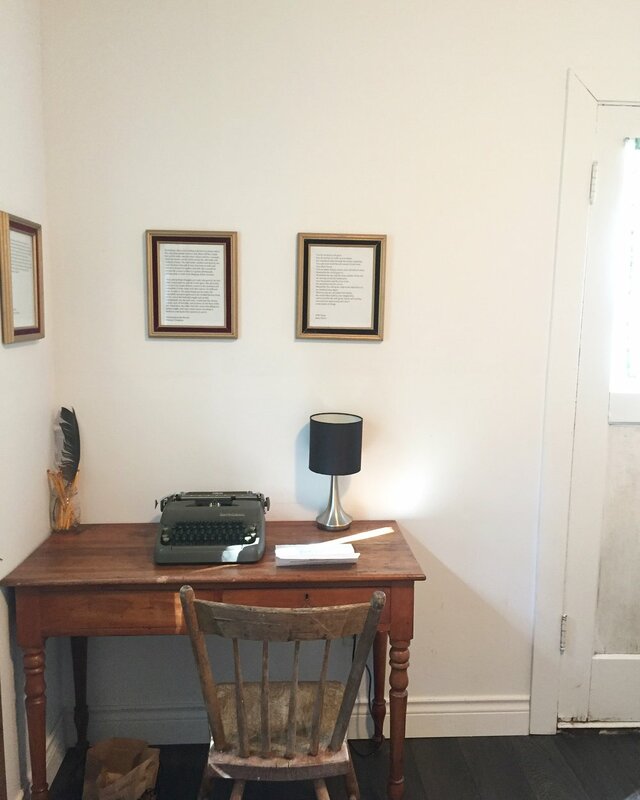 The Writer's Cabin was not only solace from a wild couple of weeks, but the perfect, most sweetly simple escape into my own sense of self and love of words. With little more than a bed, a typewriter, and the best dang nearly-nature shower a girl could ask for, it was three days of dedicated sleeping, reading, typing, and sitting with the sweet sounds of the nature. Keen to book? Keep in mind: there's no kitchen or fridge (but a cooler outside the bedroom does well for keeping snacks chilled) so you're on your own for meals. Why does that rock? Bowen has RAD options for every kind of dining: Shika Provisions, Artisan Eats (super inspired writing space), The Ruddy Potato (cafe AND grocery store - #yes), Tuscany Pizza (#droolingnow) - just to name a few. Bathroom that smells like cedar? Check. Solid sleeps sans alarm clock (true bliss). When the seemingly big 'bigness' of life needs to be put in perspective to reconnect with your creative juices, stepping out of the city and into some of the most wild nature the west coast has to offer is the fix. Tofino, BC, offers just this: the rough, rawness of the coastline, wildlife in abundance, and the gift of the patchiest cell service one could ask for (read: a justified excuse to be 'offline', if you need one). Absolutely nothing that is in an inbox, on a to-do list or flying around your brain is important enough to distract your soul from finding a whole lotta 'ahhhhh' in the mind-blowing expanse of the beaches, the never ending skyline, the deafening crash then soundless silence between waves, or the whip of sea spray in your smiling face. Walking by the water is only half the glory of a Tofino stay; sleeping as close to the water as possible is another high-priority, and Ocean Village offers that, in spades. Drown out the roar of the mental to-do list with the constant crashing of the Pacific Ocean. The sound never ceases, whether tides are high or crazy low. Be lulled to sleep by the ebb and flow, and wake up to the seagulls marking day break. And, get your hydro-meditation on: be hypnotized by the waves from the cozy comfort of your cabin. Keen to book? Keep in mind: summer is a stunner but storm season is a MUST. October/November are amazing times to get a true, blue, Tofino experience. Also, the drive: it's a bit barfy (read: rolling hills and twisting hair pin turns - at times). Set yourself up with Gravol and a front seat cruising spot if you can - and snacks. Finally: FOOD; it's really good here. Some spots you can cruise in and out of without reservations/can't make reservations at (KUMA, Shelter, Tofino Brew Co.), yet you'll absolutely need reservations to get to experience Wolf In The Fog - and you SHOULD. Book early, and show up hungry. Oh, the walks. The nature. The quiet. One studio up, one studio down. The cabins. Three years ago I went to Galiano Island for the very first time with Alex Mazerolle and the Girlvana Yoga Spring Break Retreat. And, while I was there to support Alex in her work and provide mentorship to the teens who joined us for the week (not to mention have my very own reuniting with 15-year-old-Jess), I found something I wasn't expecting: a well spring of creative energy bubbling up from Bodega Ridge's sweet simplicity. Since my first visit three years ago, I've had the privilege of returning for multiple stays, each time finding a deeper sense of home and a more appreciative sense of appreciation for the inspired slowness that is the reality on the island. The peaceful methodic fall mornings—wake up, make fire, stoke fire, boil water, stoke fire, make coffee, stoke fire, etc.—slow the fast-moving roll of most work-from-the-moment-you-rise mornings associated with my city life. Staring into the window on the fireplace, the flames are a meditation in themselves; gently rocking back and forth, sometimes raging, sometimes shrinking. It's when time slows to fully see the beauty of the normally functional things in life that perspectives expand and inspiration flows forward - with encouraging force. Keen to book? Keep in mind: fires are for fall/winter. If you're looking for cozy cabin vibes, book between November and February. Summers are for patio ciders and swimming - but let's be honest, polar bear dips are seasonless. The property is a stunning retreat + celebration venue, especially in the summer, so consider a midweek island retreat to get in on these #cabinvibes. And don't forget your Bailey's for that morning (read: all day) coffee. Can do the yoga here too. And when you retreat...the craft game is strong. Whenever a ferry is involved in a travel plan, the experience has a deeper sense of disconnect from the dailies; even when the ferry takes you to somewhere on the mainland. The Sunshine Coast is exactly that: a part of the West Coast that's still connected to the mainland (aka: not an island), yet no roads access. Thus, the magic of BC Ferries (the best kind of commuting). While not expecting to find a source of inspiration on a work-related trip for a group of local leaders, the Painted Boat Resort and Spa had so much to offer a high-vibrating brain in need of an unplug. With no shortage of docks to meander, trails to toodle down, decks to take in the sights and sounds of the harbour and big, beautiful windows to let the light in, the resort offers an unexpected access point to some free-flowing thought. Inspiration and creativity at its finest. Keen to book? Keep in mind: eyes on the road + hands at '10 and 2' - the highway from Gibson's Landing to the resort has all the wildlife - so watch that speed and keep your eyes peeled, y'all. There's tons to do and see on the Sunshine Coast - so take your time getting to (or from) the property: check out Persephone Brewing, The Gumboot Cafe, Sharkey's Fish Locker + a make time for a stop in downtown Sechelt (for all the very best in thrifting and coffee shop hopping). HAVE A SPOT THAT YOU LOVE TO ESCAPE TO? SOMEWHERE YOU GO TO LET YOUR BRAIN RELAX AND YOUR BODY UNWIND? SHARE IN THE COMMENTS BELOW, OR SEND ME A NOTE (IF YOU'RE NOT READY TO THE LET WORLD KNOW ABOUT YOUR SECRET ESCAPE...YET!). Older PostA very distant (yet not disconnected) canuck Thanksgiving.